AmericaPANIC: Picking Up the Pieces After the Republicans Wrecked America: Here's your new GOP ticket folks. McCain/Rudy. You heard it here first. Here's your new GOP ticket folks. 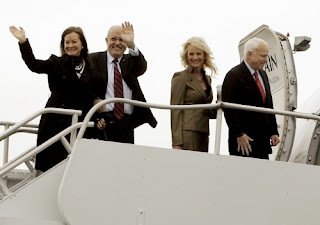 McCain/Rudy. You heard it here first. This makes it interesting, grabs the news cycle, unleashes the Rudy pit bull on Obama, and energizes a depressed and demoralized GOP. Even if the far-right hates it. And their excuse - Palin needs to spend time with her baby and preggers daughter, and didn't anticipate the cruelty and unfairness of the left-wing press and blogs - will also send the Fox News crowd into a tizzy. So, we've got ourselves a race again. One with four adults. Two of them are Class-A pricks, but it's a race. Obama still wins. But at least McCain made it interesting again. And showed America that an incompetent, unqualified, ignorant fool should never be considered for VP again. Interesting theory, but replace the word "rudy" with "mitt". With the myth-making they have done since 911, most forget that on 9/10 the people of new york couldn't get rid of Rudy fast enough. I don't think that the fact that he DIDN'T go running down the street screaming "oh my God, we're all going to die" is enough to call him a "hero". 1. He has the appearance of being better on the economy. 2. He's already sold his soul to the neo-cons, so the hard-right would like him. 3. He comes with votes. Remember, he almost won the nomination, but rudy was soundly rejected by the voters of every state he ran in. I dunno. It seems like it's the only thing he could do, change to Rudy or Mitt. But letting Palin go would so obviously be a forfeit. And the only thing McCain has for a ground game are the evangelicals. Then again, if she screws up the debate- and how could she not?! ?- then how could he continue on with her? He'll swap her out and hope for some low attention span voters. Mitt would be the best choice if the economy is the key issue. But if he chooses Rudy, I would put money down on a terrorist October surprise. God help us with these monsters. malcolm/noodles .. terror is the missing word here! with econ like this terror is next so as to distract. this makes rudy out of mitt, a dead mccain and a wtf moment giving us a real nazi prez .. if we even get to vote and have a real transition that is. .. meanwhile, that's all in the spirit of speculations of course. Rudy has a closet full of potential Party crashers and has lost his 'Godliness' appeal. Romney is in the wings. You heard it here first--from someone who apparently has no clue how the parties work. YEAH the far right will hate Rudy--and who runs the party? THE FAR RIGHT! This wouldn't be McCain's decision to make! In fact, the camera shy pitbull wasn't even his first choice--but THE PARTY disallowed his first two choices! You're wasting your time wishing for this. The party would never allow a switch now, even if they DIDN'T love the weathergirl. Have you seen the cover of National Review this week? A switch now would be death to the campaign in any case. Why do that to the kids? Rudy looks better in drag. It's 3 am and we have a crisis. uh, which two are pricks? here is obama injecting presidential politics into the bailout negotiations. I guess getting involved is a good idea now. I expect the next thing we will here about is obama suspending his campaign in order to get the senate bill passed and the dems will cheer and rip on mccain for not doing likewise. "Obama said at a rally here. “There will be time to punish those who set this fire, but now is the moment for us to come together and put the fire out. ”Obama reached out to individual House members Tuesday, signaling that the Democratic nominee was taking a deeper role in the process. The campaign would not disclose names, but said he was coordinating his efforts with the congressional leadership." Right you are. Mitt could be a very viable VP candidate. I read an honest conservative article even before the primaries had started, that predicted that McCain would get the Republican nod. Simple logic. The article stated that Bible banging nut jobs are scared to death of Mitt's Mormon underwear, and business people are scared of Baptist preachers (Huckabee.) Both sides hate and distrust each other, hence both sides will support McCain, whom NOBODY likes, but each side can support with a clear conscious, since it's NOT supporting the other side’s (of the party's) guy. Since the primary vote getter is the presidential candidate, Mitt could very possibly get in as VP. Rudy would be a waste of effort. He was damaged goods even before New York gave him the boot! You see what CEO's can do to a country. I would not want another CEO Mitt R. one heartbeat away from President. McCain does not look well. Can you imagine what this race can do to a 40 year old Man or Woman? Let alone a 72 year old man? It's sad but even if MCCAin was 40 I would not want him to be our President. We need to kick Congress out starting with Pelosi. and all the republicans...Plus Barney...Did I forget anyone? They have a great salary plus all the cash from lobbyist..They have the best health care system in the world...They sit and watch Americans die. >> Obama reached out to individual House members Tuesday, signaling that the Democratic nominee was taking a deeper role in the process. Obama would have accomplished more with a reach -around-.